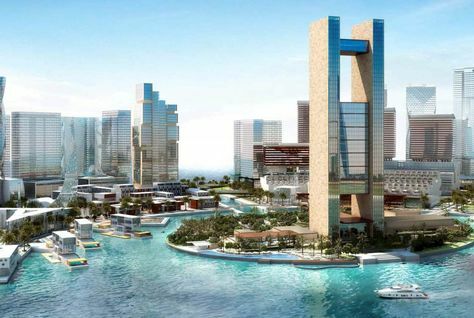 A new waterfront project inspired by schemes in Dubai, Sydney and Vancouver has been planned for Bahrain Bay. The project is part of a 3.5km boulevard located around Bahrain Bay, upcoming shopping destination The Avenues and Bahrain Financial Harbour, reported Gulf Daily News. It is part of a plan to “change the face of Bahrain Bay and give it a public face,” according to the project’s chief executive Gagan Suri. “What’s missing here is life – we have offices, we have a hotel, but we don’t have a residential building – but it’s coming soon. There will be life in the development once that happens in the evenings and the weekends as well,” he said, adding work had already begun on a half-kilometre stretch which would tie up with another 3km development to create the circular boulevard. “It has to be something different and unique that doesn’t exist in Bahrain. We have a couple of interesting ideas in Bahrain – we’re getting close to a decision. Ideas are inspired by other things, regional and outside – a lot of waterfront areas in Sydney, Vancouver, Washington, DC, a couple of unique concepts in Dubai and Beirut,” Suri said. The executive revealed three other projects have been confirmed and will start construction within the next six months. These include AXA Insurance’s regional headquarters, a Marriott hotel and a Bin Faqeeh development.